Oshkosh, WI, senior care agencies know that taking care of an aging relative is hard work. Your day is full of helping your loved one with numerous tasks from bathing and dressing to preparing meals and housekeeping. You may not feel you have time to sit down and journal, but doing so will benefit you in many ways. There’s no doubt that you love your aging parent, but you will inevitably feel angry, frustrated, and anxious from time to time while caring for him or her. These feelings are normal and understandable. Journaling gives you a healthy outlet to express all of your thoughts and feelings to reduce stress. Journaling often leads to new insights and perspectives on issues. It also forces you to organize your thoughts, which can help when you’re facing a hurdle. Additionally, journaling helps you clarify your thoughts and feelings regarding the challenge at hand. When you write in a journal, you are only focusing on the task in front of you. Journaling can help you become more mindful in your daily life, allowing you to focus on each moment you spend with your loved one instead of focusing on the past or the future. It’s important to take some time for yourself each day. If you don’t, your mental and physical health will decline. Writing in a journal for 10 or 15 minutes each day is a great way to have some “you time” where you can rest and recharge. Keeping a daily journal creates a written record of events. Later on, you’ll be able to go back and read about the good times you shared with your loved one while you took care of him or her. Inevitably, you will have disagreements with siblings, doctors, or your loved one regarding his or her care. Writing in a journal allows you to express your thoughts and feelings about frustrating situations without causing conflict. Having this outlet may help you have fewer arguments with your loved one or other family members. Caregiving is both rewarding and overwhelming. 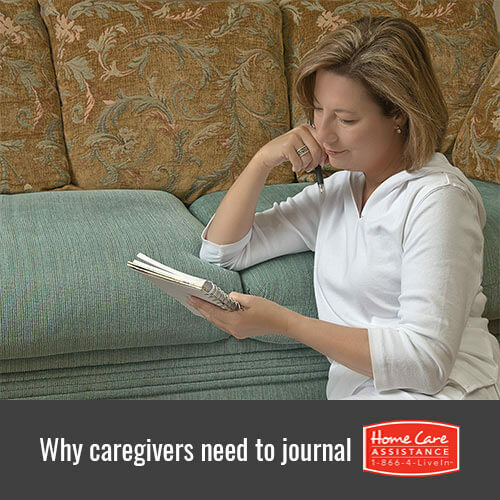 Daily journaling is a great way to take care of yourself so that you can continue to care for your loved one. You can also turn to Home Care Assistance of Oshkosh for a helping hand. We provide reliable respite care in Oshkosh that helps your loved one in the comfort of home while you take some time for yourself. Learn more by calling 920-710-CARE (2273) to customize a care plan for your loved one today.